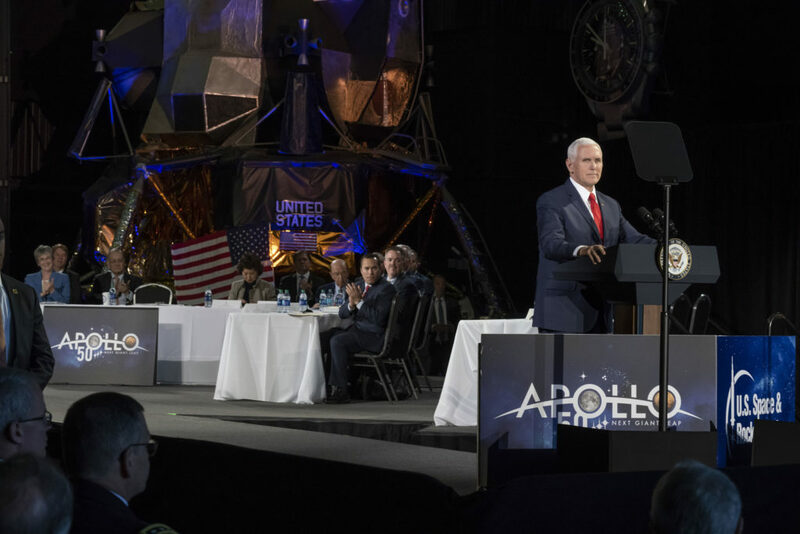 March 27, 2019 – At a National Space Council meeting in Huntsville, Alabama on Tuesday, Vice President Mike Pence urged NASA Administrator Jim Bridenstine to accelerate the agency’s lunar exploration plans with the goal of returning American astronauts to the moon in only five years. President Donald J. Trump is setting a goal to land American astronauts near the Moon’s South Pole by 2024 and to establish a sustainable human presence on the Moon by 2028. NASA’s lunar presence will focus on science, resource management, and risk reduction for future missions to Mars. “Today we stand at the dawn of a new era of space exploration — an era that will bring untold new challenges and opportunities, and it will demand the best of us. It will demand new ideas, renewed energies, courage, and bold action,” Pence said. For NASA to achieve its five-year goal, the agency will have to meet a rigorous schedule for flying Exploration Mission-1 with Orion on the Space Launch System (SLS) rocket next year, and for sending the first crewed mission to the lunar vicinity by 2022. Until now, the program has been plagued by delays and funding shortages, and while Administrator Bridenstine feels confident that NASA is up to the challenge, American astronauts will return to the moon in five years “by any means necessary,” according to Pence. “If American industry can provide critical commercial services without government development, then we’ll buy them. And if commercial rockets are the only way to get American astronauts to the Moon in the next five years, then commercial rockets it will be,” said Pence. Lockheed Martin’s Orion spacecraft is currently the only capsule specifically designed and built to withstand the extreme environment of deep space. Orion and its complementary service module will contain components for life support, navigation, radiation shielding, communications and a protective heat shield.